David, no question there are good arguments for using a 5x4 back on a 10x8 camera; long lens use jumps immediately to mind. But, as with most things photography related there are tradeoffs. For example, I can put my Schneider 480mm Artar on my Arca-Swiss and it's solid as a rock. Put that same lens on my Deardorff--I wouldn't even pretend to use it on the Intrepid--and things can get shaky, depending on wind factors. The small 450mm Fuji C would be a better choice, IMO, in this focal length. I bet the Intrepid could handle that lens, too. Now that you've got me thinking, how about a 10x4 back for the 10x8? Now that's something I'd be interested in! My longest lens is 420mm in Copal 3 so not really lightweight. When the camera is racked out fully, it's stable but loose, mostly laterally. I think it could work with gentleness, care and no wind at all. The front standard is surprisingly robust and can take a heavy lens. I think I might find a small G-clamp to put in the bag for improving stability at large extensions. Would it be easier to split a sheath lengthwise and use that for a 10x4 panorama? It seems to be a popular workaround. While testing for wobble (very scientific – give to a shove) I discovered that most of the flexing was attributable to Gitzo. My head* had become slightly loose. An Allen key, a few moment's work and the Intrepid was much more stable. All kinds of alternative backs might be possible. They might even sell an "undrilled" blank backplate for experimentation. * Story of my life, eh? I found a small plastic clamp, of the sort with a ratchet between the handles. It's about five inches long and weighs 50g. At full extension, with a lens mounted, I clamped the moving bed to the baseboard and got very much better rigidity. 50g is not a great additional burden. Yes, I did see that. But thank you all the same. Ben Horne a very competent photographer in the American tradition of heroic landscape photography. In my view, he's an excellent ambassador for the Craft. Our closest version of him is Thomas Heaton, who lives in Whitley Bay. TH uses a digital SLR but their approaches to making images seem very similar. Both men take very few images on a trip and both seem able to explain what they are doing and why. BH has tried LF photography with an Intrepid 5x4. Making the videos is another remarkable skill they share. There is a YouTube video of them meeting. Yep, Thomas Heaton is another of my favorite photographers that I follow. Agreed that both create excellent video footage! I re-watched that BH video. It's remarkably flattering to compare one camera with another costing fourteen times as much. (Teamwork, pre-Brexit, inc VAT) I'd forgotten the blue string, but it seems to work. He seems to like string. On mine, the the front-standard-to-baseboard connection is quite firm and any movement is from the slightly looser fit of the moving parts. I've read that Ebony users can suffer from both tightness and looseness of the focusing track and are advised to carry a suitable screwdriver with them to adjust this in the field. The Intrepid comes out ahead of the Arca on bellows length, although I'm sure that Arca have other bellows available. Apart from weight and price, the Arca is very desirable. I admit that I like pretty toys for their own sake. May I make another comment on both BH and TH? Although they are adventurous in the sense of venturing into the wilderness (you will have seen TH's encounter with a Land Rover in a blizzard), they both stick to classical/traditional subject matter. None the worse for that of course. Have you come across Isaac Sachs? He seems to make the mundane extraordinary. David, it's still early with my Intrepid, but, so far, I have no complaints with the rigidity of the front standard; I am using lightweight Fuji A series lenses so that may account for it. 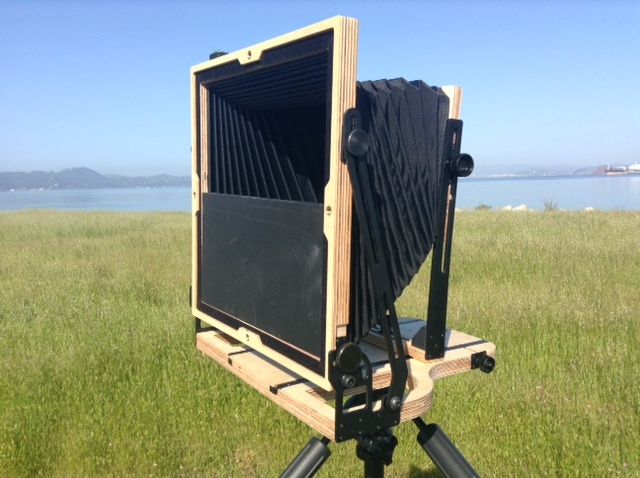 Owning a 5x4 Arca-Swiss F line camera, I'd love to have the 10x8--that Orbix movement makes me drool a bit--but my budget won't allow it. I, too, like finely machined and crafted hardware; one of the reasons I own two Leica M6's! Same with me and mine. It seems astonishingly rigid for so little weight. I have put a Nikkor 360mm f6.5 on it and there seems to be no problem. At long extensions, focusing is a little stiffer and raising the lens is harder because it's a very heavy lens, but it would be on any camera. In fact, it almost doubles the weight of the camera. I have to be careful when taking it off the tripod because it's so front-heavy with the Nikkor in place. I fear we must differ on Mr Sachs. His was a name that came to mind when I was trying to think of a photographer who tries (and in your view fails, I think) to use non-traditional subject matter and unheroic lighting. I hadn't spotted the process errors, so I'll return to him in a different frame of mind. There way be better examples of what I was trying to say. I do agree that the two others are both very good at what they do. Well, both of the things they do; creating images and making an engaging account of the process. Yep, saw that...I have a large (about 10cm square) Kirk plate, with buit-in Arca-Swiss mounting attached to my Intrepid. I, originally, bought it for my Deardorff, but found using that camera on a ballhead too cumbersome. The Intrepid works great on the ballhead. I had mine out this morning for a while. It is ridiculously light on a carbon fibre tripod. Definitely needs weighing down on windy days. Here it is with a 4x10/5x8 mask insert in the back and the lens panel offset to center on the wide format. The lens I used was a 270mm f9 G-Claron. I hope to get the film developed this weekend. There was only 3-4 stops between the grass, water, bridge, and sky - amazing how flat things can be even in bright sunlight - so I may go for more contrast. That does look like an easy, portable and economical modification, much better than mutilating a dark slide. Do you plan any other masking shapes? The mask is just two pieces of 3mm birch ply (what else for a plywood camera?) laminated to give 6mm. I had the 3mm plywood on hand, and laminating it might make it less liable to warping. On the other hand replacement is easy enough. It is about 3mm over half the opening size to give some separation between exposures. It is a close fit, but does not bind. It is easy enough for 4x10. For horizontal use the holder goes in from the left or right with the mask at the bottom. For vertical the holder comes in from above, and the mask is swapped to the other side. 5x8 is more of a problem unless you work out a way to hold the mask in place against gravity. There is one orientation where the holder has to be inserted from the bottom. That is a bit odd, and the rear tilt is a bit limited in order to allow the holder in. There is just enough shift and rise on the camera to zero the lens on the format. That's why I don't think there is much scope for other format masks. The 5x8 needs about 64mm of offset to center the lens, and that is about the limit of the camera. The Richmond-San Rafael bridge (in the background of the picture) is long and has just water and sky around it. It seemed a good choice for 4x10. Excellent. Might it be helpful be to remove the whole back, using the fixing screws, insert the dark-slide, then replace the whole ensemble and withdraw the sheath? For 5x8 with the mask at the top, you might drill two tiny holes, one on each side of the frame and insert short, thin pins that would protrude just enough (<1mm) to prevent the plate from dropping. I'm writing this without first looking, so it may be nonsense. All the same, it's a very neat and clever modification. Here's the 4x10 sheet from the setup shown previously. HP5+, Thornton Two Bath 6+6 minutes, 20g/l sodium metaborate for bath B. 1/60 f22, 270mm f9 G-Claron. Bright sun, but looking north the subject brightness range was not a lot over 3 stops, hence the more energetic accelerating bath. The separation looks large, but it won't be if they are cut. 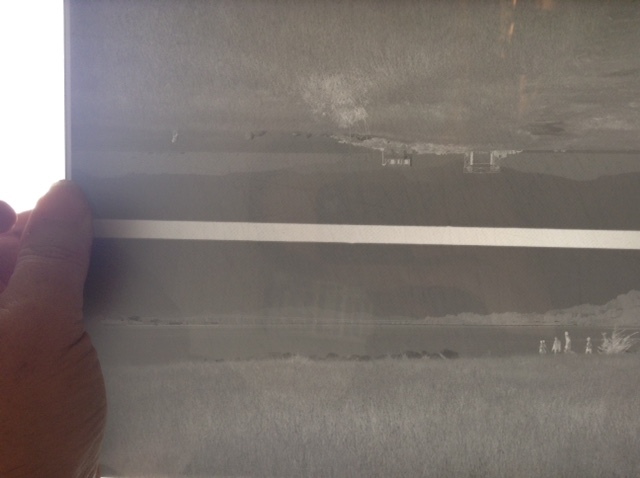 Considering that the mask is some 5mm or more from the film, the edge is pretty clean. That looks entirely successful. Well done. How do you plan to make the cut? Just scissors. Less chance of scratches than using a trimmer. I probably won't bother unless there is a good reason.